Mediamaster is an online music server that lets you store, play, and share music online. It is a web based music collection place, you can use two ways upload your music from your computer, one is single track upload, another is drag your songs to fold of uploader. After that, you can create and manage playlists, rate songs, and share your music with others with embeddable widgets for blogs, Web sites, and social networking profiles. 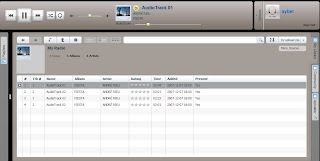 Mediamaster has a nice interface, it matchs iTunes and Windows Media Player if you use them, upload songs from them. It supports unprotceted MP3, WMA, and M4A (AAC) file, but no way to download them.